Hi. Chances are you don't know me, and you've probably never heard of me. You would think at fifty years old if I were going to do something big I would have started by now. Well I have started, it's just the rest of the world takes a bit of time to catch up I guess. I'm a high school graduate that has worked for IBM since I was eighteen years old. I blame a combination of restlessness and laziness on my lack of a college degree but I have been blessed with a good heart, above average intelligence, and a very creative mind. I often can't remember if I took my blood pressure medicine or not today, because my brain is often wandering off thinking about what our world will be like twenty, fifty, and one hundred years from now. The world my grandchildren might grow up in. I see computers replacing a great deal of our logical thinking, and society raising the value of our most creative people. I believe it will become just as important (perhaps more) to place a value on an individuals creativity than their intelligence. So let's cut to the chase. I think of myself as very creative, (and redundant too). Probably above all, I love creating humor. I've been a sucker for caption contests since they started showing up on line. I win once in a while, but the judging seems crude. It occurred to me that a better way to run a caption contest would be to have the public vote. So what I did was put together a site where in order to submit a caption, you have to do some voting. 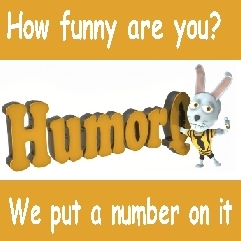 The website is http://www.humorq.com . Here's where it gets good though. While doing this I realized we can give every entry a value based on it's popuarity. We can track a member's popularity over time and place a value on their ability to create humor. Thus the name HumorQ. Humor is one of the great characteristics and advantages that I'm hoping we will hold forever over computers. I see a world only ten years from now where a marketing firm wants to see your HumorQ on their job application. And twenty years from now, I see it on everyone's job application. Discovering the world's top HumorQ scores means finding some of our most creative without them stumbling into success. It means an opportunity to recognize creativity very early, and discover some great human problem solvers and place them where we can leverage their creativity into a better world.